As I explained here yesterday, a C-SPAN caller asked Senator John Barrossa (R-WY) if insufficient or misdirected prayer had caused God to not only omit smiting the foul Democrat Robert Byrd but also to cause James Inhofe (R-OK) to be absent from the vote. Back in April, a man with a very similar voice, and also from Georgia, called in and asked David Brooks if he, as a sophisticated New Yorker, would help to bring down the black man in the White House. Brooks was laughing in disbelief at what he was hearing. 1. Talking Points Memo rightly points out that this guy identifies himself as being a member of a "teabag group," which is a term that teapartiers find offensive. As they should, because many of them looked foolish when someone pointed out what "teabagging" means. After all, many teaparty members are so afraid of homosexuals that they believe in the existence of an Elders of Zion-level clandestine "gay agenda" designed to introduce subversively butch curricula to our children and to poison our elders with subsonic homowaves that induce sodomania that drives Jeff Gordon to wear a newsboy cap and The Nuge to chop his mane and styling-wax the remnants. Yet, despite this paralytic terror, they proudly called themselves teabaggers on blogs, Twitter and signage until someone in charge who'd attended a fraternity recently explained that they'd just affiliated themselves with garlanding men's heads with balls. Simply put: the guy on the phone identifying himself as a member of a teabag group could be making a very funny hoaxing pun, but at the same time, if it were real, it wouldn't demonstrate any particularly unique social or verbal oblivion for those people. 2. When you've already got the same group of people carrying effigies of the president's head on a stick, describing him as an animal in a zoo and suggesting that he was one of the 9/11 hijackers, adding another element of passive-aggressive violence to the mix hardly strains the imagination. 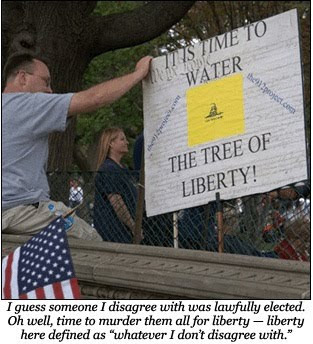 If they lustily march back and forth with their Jefferson quotes about the tree of liberty being watered with blood, how much of a stretch is it to suggest that they weep that their God might kill for them? Because here's the thing: when the distance between the parody and the thing it hopes to parody becomes vanishingly small, the veracity of the parody itself becomes a distinction without a difference. At this point, it doesn't really matter if this is a hoax since it neither intensifies nor broadens the sort of puling, self-pitying and vengeful demands these people already sincerely make. The music might be different, but the dance is still the same. 3. Even if the call were a hoax, it can't work without an atmosphere that validates it. Just as a parody can't exist without a sincere primary text, a prank can't work without a social milieu that already features almost all the plausible elements of it; the prank just tweaks or re-orients what's already there. If it's proved that this was a gag, conservative bloggers and commentators will have a field day. However, lost amidst the clowns and prevaricators at Red State and Breitbart exulting that this is just another in a long line of sinister liberal hoaxes — like Obama's being an American citizen, the 2008 election results and over half of all Americans wanting socialized healthcare — will be the fact that it could not have worked without a Republican senator coming up with the idea. The backlash will define the story until it obscures its very reason for being. Take the Martin Eisenstadt hoax, when he confirmed an existing story that Sarah Palin said Africa was a country. As soon as news outlets could prove that Eisenstadt wasn't real, the story became about the perfidy of his nonexistence. Yet the gag was that Eisenstadt was a fake person confirming a real story, one that FOX News (and the reporter who went on the air with it, Carl Cameron) have never retracted. Still, because Eisenstadt was fake, merely the act of his fake-person-ness commenting on a real story made the real story fake as well. Somehow a McCain campaign staffer's anonymous disclosure to a reporter from a conservative news network became the stuff of treacherous liberal intrigue as soon as two liberals noticed it. Much the same will happen here, as the enthusiastic stooges of the American right rush to dismiss the entire story by making it about the hoax and hoaxster instead of the thing he was ridiculing. And it's very important to them that that happens, because irrespective of whether the C-SPAN caller was real or a hoax is the undeniable fact that a sitting American senator from the Republican party encouraged American Republicans to beseech almighty God to make something bad happen to a Democrat. Sure, he didn't explicitly say, "Ask God to kill Robert Byrd," but that's the great thing about plausible deniability. That last area is the only place where the Republican party engages in any rhetorical commerce anymore. Palin goes on the campaign trail and does her best to reiterate that Obama pals around with terrorists, is a socialist and will wed American interests to the international community until all the dog whistles play the same notes: foreign, arab, commie. Saxby Chambliss mobilizes voters in Georgia, noting that Obama supporters are turning out en masse by saying, "The other folks are voting" — not only a literal usage of "othering" the opponent but classic dog whistle invocation of, "NIGGERS—niggers are using the franchise and gonna steal our white government." Countless Republican US senators and representatives (like Patrick McHenry), when asked about Obama's citizenship, say that, "They need to see the evidence," or, "I think so, but I believe other people have a right to look at the documents to see for themselves," all of which ignores that he's irrefutably an American-born citizen but still says to the base, "Well, maybe the proof isn't good. 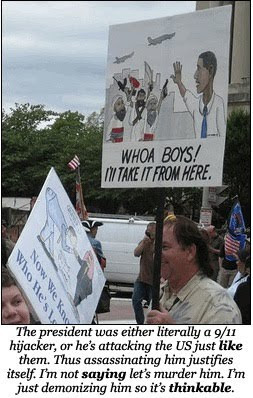 Maybe Obama's a Kenyan muslim. We have to be sure." Thus Bill O'Reilly can call George Tiller a "baby killer" who will reap a "judgment day" because anyone who prevents the state from stopping him has "blood on his hands," but his exhortations don't legally constitute cheerleading a murder, even after the murder occurs. So sure, maybe the C-Span caller is some kooky liberal with an axe to grind. Maybe he's a jerk himself. But his call doesn't resonate with anyone as compelling or probative if he doesn't cloak his comments in the same sobbing sense of self-indulgent aggressive victimhood that members of the Republican party already swaddle themselves in. He isn't interesting if he isn't applying a level of verbal violence redolent of the entire teaparty phenomenon, toxic conspiracist conservative websites like WorldNetDaily, the let's-stage-a-coup mentality of NewsMax, or countless Republican congressmen who, when it comes to this undisguised malice, hope to ride the back of the tiger without ending up inside. What remains from this little story, and what should remain, is that the caller exemplifies exactly the sort of thinking that happens when you issue your message from and to the gray space of plausible deniability and dog-whistle motivations. The caller's credentials are secondary to the fact that a certifiably real Republican senator sent out the message that we should entreat God to stop some Democrat — that a public servant of a major party left rhetorical room for anyone to step in and say, "Yes, I have done as you said. I have asked the Lord to destroy my enemies, people who cast votes for that which I don't support. I have asked for their blood in His name," the same blood that is perhaps intended the next time another Republican elected official digs himself out of a segment with more boilerplate undergradutate Jefferson. The biggest lesson here, of course, is that the caller is one of many, representing the danger that arises when you persist in fighting political and conceptual battles with tropes of revolutionary and retributive violence in an area of ambiguity. It's a lesson that the murder of George Tiller already taught, and a lesson that American conservatives will refuse to learn until someone else gets murdered, and someone else, and someone else... until — horrifically — a conservative representative or pundit is found legally liable for a death and subject to penalty. That's when it will have finally gone too far. Until then, it's just such a wonderful tool.